VATICAN CITY (CNS) — Priests must always keep in mind that their mission is to serve others and not claim superiority over the people entrusted to their care, Pope Francis said. 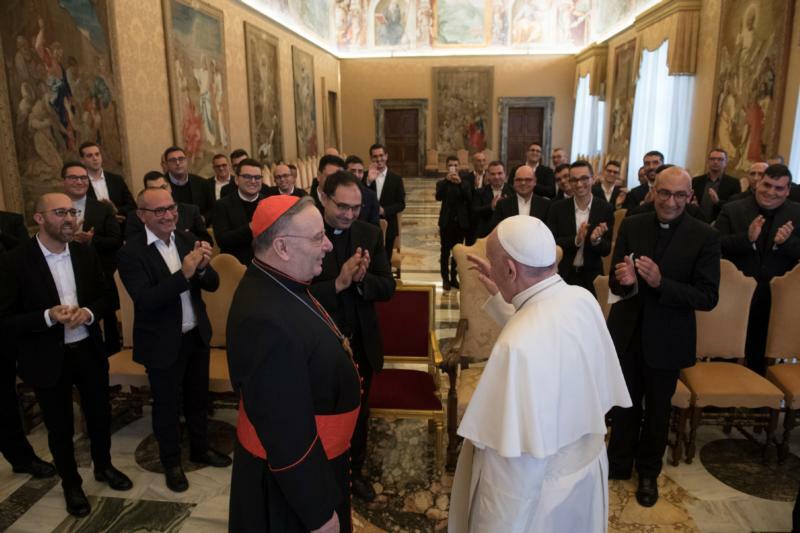 Meeting with seminarians from the Sicilian coastal city of Agrigento Nov. 24, the pope and told them that priests must never forget their roots and that God chose them from among their people to serve. “The bishop doesn’t just assign a task — ‘take care of this parish’ — as if he were the head of bank that assigns tasks to employees. No, the bishop gives a mission: ‘Go, sanctify those people, bring Christ to those people.’ It is another level,” the pope said. Although priests from religious congregations have their own distinct spiritualties, Pope Francis said the spirituality of diocesan clergy are based on three relationships, the first of which is the relationship with their bishop. “Please do not forget your mother, father, grandmother, grandfather, village, poverty, the difficulties of families: do not forget them,” the pope exclaimed. “The Lord has taken you from there, from the people of God. Because with this, with this memory, you will know how to speak to the people of God, how to serve the people of God.